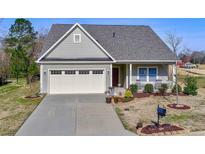 Below you can view all the homes for sale in the Stonebridge subdivision located in Monroe North Carolina. Listings in Stonebridge are updated daily from data we receive from the Charlotte multiple listing service. To learn more about any of these homes or to receive custom notifications when a new property is listed for sale in Stonebridge, give us a call at 704 604 8836. More photos area available for viewing here: https://youtu.be/pIxlE6odgFQ Don't forget to check the attached virtual tour! MLS#3496477. Mark Spain Real Estate. Covered patio has hook up for TV. MLS#3496360. Keller Williams Union County. Access to highly rated golf course, resort style pool, wading pool and lighted tennis/pickleball courts. MLS#3490632. Better Homes and Gardens Real Estate Paracle. This home is a must see! MLS#3486499. Berkshire Hathaway HomeServices Carolinas Realty.